This traditional family favourite has been given a colour overhaul and is packed with nutrition and flavour. It is a very easy dish to make and there will be plenty left for the next day. A family favourite given a colourful transformation! Begin with 1kg of the best grass fed beef mince available. Place this in a pot with 1 tablespoon of coconut oil and start to brown on a low heat. Add one diced brown onion, 2 tablespoons of organic tomato paste, 2 tablespoons of coconut flour and your spices. You can make this dish as spicy or mild as you like depending on who is eating it. I added in pink rock salt, black pepper, ground ginger, turmeric, lots of cumin, cinnamon and a pinch of paprika. Give it a good mix and when nicely blended and browned add in 2 cups of home-made bone broth or stock plus a few dashes of coconut amino sauce. Place the lid on and let this simmer for several hours. 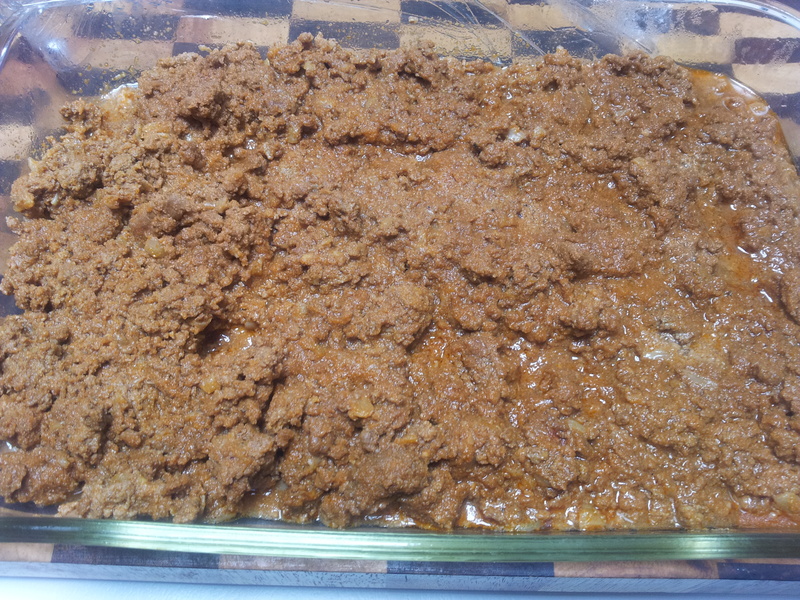 When it is done place the meat sauce in to a large baking dish and even out with a spatula. The meat sauce could be eaten on its own. If you are prepping this for later on in the day leave the mix to cool a bit while you prepare the topping. Otherwise you can cook the vegetables while the meat sauce is cooking and eat it as soon as the vegetables are cooked. 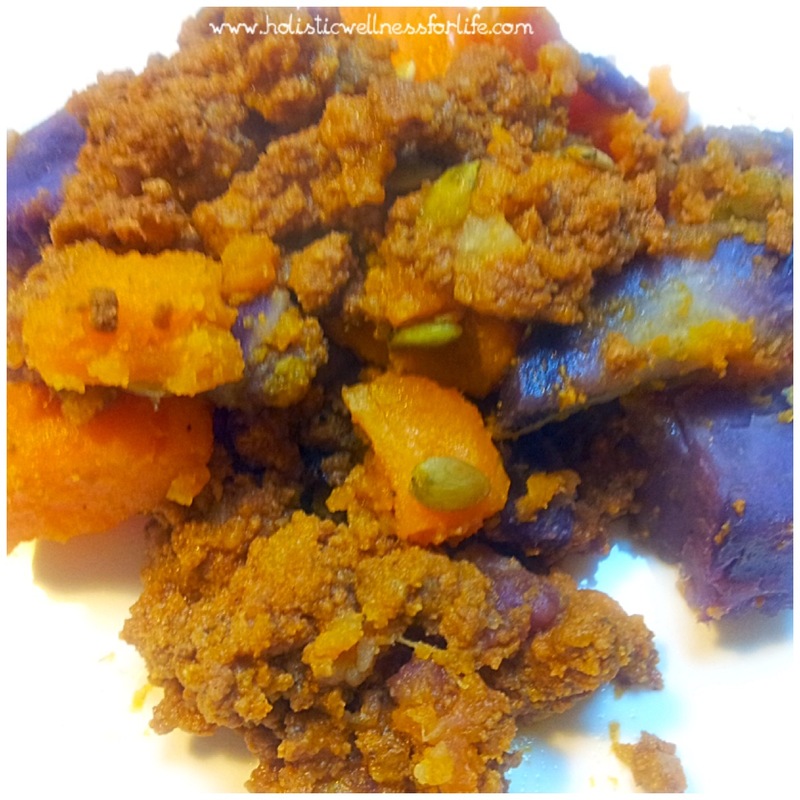 The traditional white potato topping makes way for a colourful sweet potato mix. You could use just orange sweet potato but l chose the orange and white varieties. 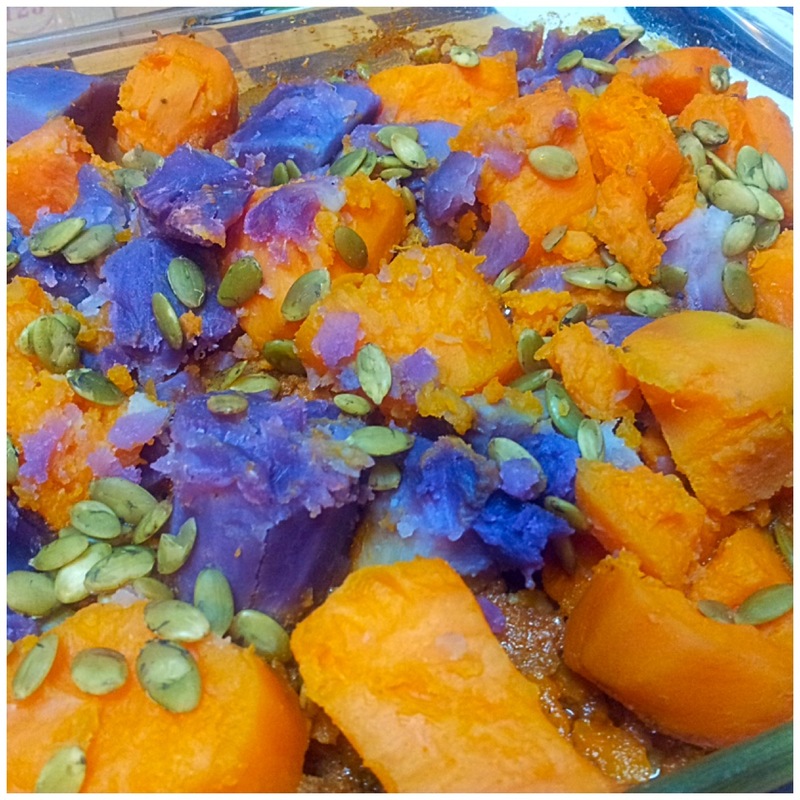 The number of sweet potato required will depend upon the size of your dish but l used three medium ones. Peel and wash the sweet potato, then chop into large pieces and place in a steamer. 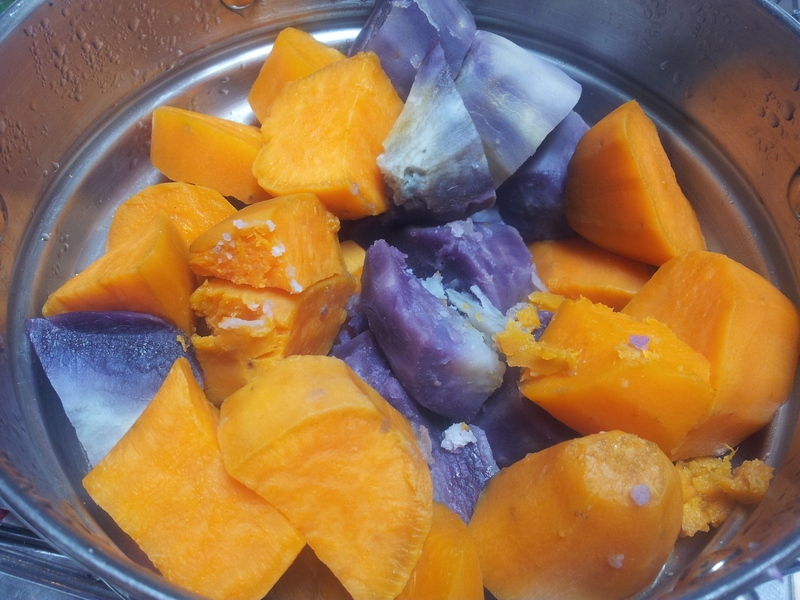 The white sweet potato are so surprising in that they turn a lovely purple shade when cooked with both varieties having a similar flavour but the orange one containing more beta-carotene than the white. Carefully place each piece of sweet potato onto the pie using tongues and lightly crush by gently squeezing the tongues. Ensure an even coverage over the pie. Sprinkle raw activated pumpkin seeds generously over the top and place the whole dish in the oven for a few minutes to crisp them up. Serve and enjoy. If you are preparing this meal to eat later in the day then store it covered in the fridge until just before meal time. Cover it with foil and heat in a pre-heated oven (180 degrees) until warm all the way through and the gorgeous aroma is moving through your home. A hearty meal made from real food.